Chances are that you are sitting down right now. In fact, many of us spend 70% or more of the time that we are awake sitting down – at the office, watching TV, driving, and so on (1). According to a national study, we spend an average of almost 8 hours sitting every day (2). For some people that number is even higher- as much as 15 hours per day (2). Could all this sitting be contributing to the obesity epidemic? Or hurting our health in other ways? The short answer is ‘yes’. 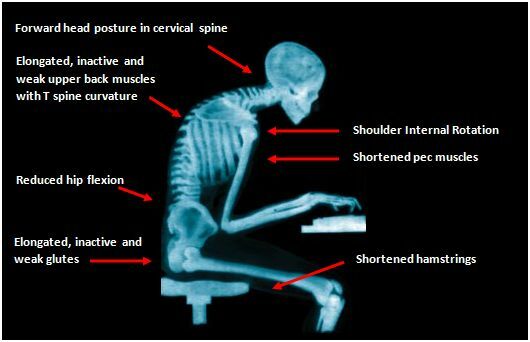 Scientific research is beginning to reveal the impact all this sitting is having on our health. This article will explain the very real health risks of sitting too much, and offer suggestions to combat these risks. Why are we sitting so much?? Compared with former generations, we spend a lot more time in situations that either limit our activity or require that we sit. At work, we are twice as likely to be in a low-activity job (sitting at a desk most of the time) than a high-activity job (ex. construction, manufacturing, farming). This is a big change from 1970, when 3 in 10 jobs required high-activity, compared to only 2 in 10 requiring only light activity (1). At home, too, our lives have become less active. We put laundry in the washing machine and dishes in the dishwasher. We might even let the robotic vacuum clean the floors while we sit on the couch with our feet up. The machines do the physical work that decades ago we would have had to do ourselves. Other reasons we sit so much include TV watching – which averages out to 4 hours a day for Americans- and driving in our cars – an average of 1 hour each day (3, 4). The bottom line: Over time, our home, work and social environments have changed in ways that increasingly allow us, or in some cases require us, to sit for long periods. People who spend more time sitting have a higher risk of dying, compared to those who sit less (5). A recent analysis found that adults who sit the most increase their risk of dying by 22% compared to those who sit the least (5). In addition to increasing risk of death overall, sitting has been clearly shown to increase risk of specific chronic diseases – heart disease, cancer, diabetes and obesity (5). Sedentary behavior increases risk of getting cardiovascular disease (CVD) by 14%, and of dying from CVD by 15%, according to an analysis of studies on the topic to-date (5). CVD is a type of heart disease and a common cause of heart attack and stroke. Sedentary behavior, which is the term most scientists doing research on sitting use, refers to not only sitting, but also to lying down, and any other situation where you would expend very little energy (1). Scientists have looked at total sitting time, television viewing time, and time spent riding in a car – all increased risk of dying from CVD (5). A study of over 8000 adults found that each additional hour of television-watching increased risk of death from cardiovascular disease by 18% (6). In an observational study, men who spent more than 10 hours per week riding in a car had an 82% greater risk of dying from CVD than those who spent less than 4 hours per week in a car. Those who spent more than 23 hours each week either in a car or watching television had a 64% greater risk compared to those who spent less than 11 hours per week doing the same (7). The bottom line: Sitting increases risk both of getting cardiovascular disease and dying from it. According to one analysis, those who are the most sedentary have a 13% greater risk of getting cancer than those who are least sedentary. The most sedentary are also 13% more likely to die of cancer than the least sedentary (5). An analysis of 43 studies compared cancer risk among the most sedentary people to that of the least sedentary. Those who watched the most television had 54% higher risk of colon cancer, and those who sat the most at work had 24% higher risk (8). The increased risk was observed even in people that exercised regularly (8). For endometrial cancer, those who watched the most TV had 66% greater risk, and those with the most total sitting time had 32% higher risk (8). The bottom line: Sitting increases risk of getting and dying from cancer. Evidence has shown specific risks for colon cancer and endometrial cancer. A lot of sedentary time also increases risk for weight gain and diabetes. A study of over 50,000 women found that each 2 hour/day increase in TV watching was associated with a 23% increased risk of obesity and 14% increased risk of diabetes. Each 2 hour/day increase in sitting at work was associated with a 5% increase in obesity and 7% increase in diabetes (9). These results were observed even in people who exercised regularly. An observational study of 10 lean and 10 mildly obese people found that those who were obese were seated an average of 2 hours longer per day than the lean people. The authors suggested that if obese individuals spent less time sitting and more time walking or standing, they might expend an additional 350 calories per day (10). The bottom line: Longer hours spent sitting increase risk of weight gain and of developing diabetes. Why Exactly is Sitting so Risky? During long periods of sitting, our muscles contract less often since they are not being needed to make us move. Scientists now think it is this lack of contractions that leads to health risks by reducing the activity of a specific enzyme called lipoprotein lipase (LPL) (1). In muscles, LPL is responsible for controlling the breakdown of triglycerides (a type of “bad” cholesterol that increases risk of heart disease). Studies using rodent models showed that in sedentary rodents LPL is much less active. The result was more triglycerides in the blood, and less HDL (a “good” cholesterol) (11). Studies have shown that LPL may also have effects on blood pressure, metabolic syndrome, coronary artery disease, and possibly insulin resistance (12, 13, 14, 15, 16, 17, 18). The bottom line: Research into the specific mechanism by which sitting increases risk of disease is still in its early stages. Scientists believe, however, that it involves a specific enzyme that is less active when we are sitting. But I Work Out! Doesn’t that Protect Me? Unfortunately, it does not appear to protect from the risks of prolonged sitting. Sitting too much is a risk factor for these diseases even if you go to the gym on a regular basis. Don’t get me wrong – regular physical activity is still important! Exercise definitely helps to prevent and manage chronic diseases like diabetes, heart disease and obesity. However, the negative effects of sitting too much are independent of how much exercise we get (6). Moving our muscles for an hour at the gym just does not make up for the lack of muscle contractions throughout the day. In a study of Australian adults who met the public health recommendations for physical activity, those who spent more time watching television had higher blood pressure, larger waists, and higher blood sugar levels than those who watched less. In women, cholesterol levels were also adversely affected (19). Another study of over 17,000 adults similarly found that those who sat more had a 54% higher risk of dying from any cause, and a 54% higher risk of dying from CVD. These results were independent of leisure time physical activity. The authors suggested that in addition to promoting physical activity, physicians should discourage sitting for extended periods (20). The bottom line: Although exercise is definitely important for health, even among people who exercise regularly sitting is an independent risk for disease. How Do I Get Moving When I Have a Desk Job? Many of us simply don’t have the option to be moving and active all day. Our jobs or schooling require long periods of sitting. But, even for people who are required to sit a lot, there are some things that we can do. Scientists do not know yet whether there is a “safe” level of sitting time, but they do agree that spending less time sitting can reduce health risks. Any of these tips that you can incorporate into your day are likely to help. When you do go to the gym or exercise outdoors, move in a variety of ways. People often do the same form of exercise day after day, and week after week – runners run, bikers bike, etc. But what many people don’t realize is that doing a limited variety of activities results in working only a limited set of muscles. Another way to look at it: most of the time you are only moving through one plane of motion, when we actually have three to choose from. Sagittal: Movements through this plane consist of anything that is forwards or backwards. Running, walking, swimming laps, and bench pressing are all examples of movement in the sagittal plane. Frontal or Coronal: Movements through this plane are either sideways, like side lunges, or vertical in nature such as standing up and sitting down or using an overhead press. Transverse: Movement examples in this plane would be anything rotational. Cable woodchops, spinning kicks, etc. If you want to get the most bang for your movement buck, I would highly recommend moving through all three planes… as often as possible. Moving through all three planes of motion develops neuromuscular efficiency, strength, range of motion, and helps prevent injury. In your exercise life, consider becoming a generalist rather than a specialist. That is, rather than focusing on just one sport or activity, incorporate activities throughout the week that move you through all of the three planes. The bottom line: Incorporate movement into your day wherever possible. If you need to be seated for a long time, get up once an hour to move around at least a bit. When you exercise, move your body in a variety of ways to gain the most benefit. Sitting is risky. Period. It increases risk of heart disease, cancer, obesity and diabetes. Scientists are just beginning to understand why it is so risky, but the risk itself is clear. Reduce your risk by building small movements into your day – park farther away, walk at lunch, take a walking meeting rather than sitting down with your colleagues, etc. And, even though sitting increases health risks whether or not you exercise regularly, exercise itself has its own benefits. Develop a varied exercise routine to get the most out of your time at the gym. Now that you know the facts…sit less, move more, and in all planes of motion!